This shawl came about as part of a collaboration with the lovely Natasha at Hill View Farms and as she has the most gorgeous yarns in stunning shades, it was my absolute pleasure to say 'yes please' to working with her and to come up with a design for them. Hill View Farms has a stand at the Country Living Christmas Fair and Natasha will be there, surrounded by yarny goodness and selling two of my patterns as kits too. Very exciting! The fair is on from 7th to 11th November at the Business Design Centre in Islington. Just pop over to the Country Living Fair website for all the information and tickets. Each kit will have two hanks of her delicious Dabbler DK yarn and a copy of my Frosted Sugar Plum Shawl pattern for you to enjoy. And as if that wasn't enough, she'll also have kits for my Linden Bee Shawl which I made using her gorgeous new yarn base, Twinkle, which has a lovely touch of stellina sparkle to it. You can see the Linden Bee Shawl I made with Hill View Yarns here. 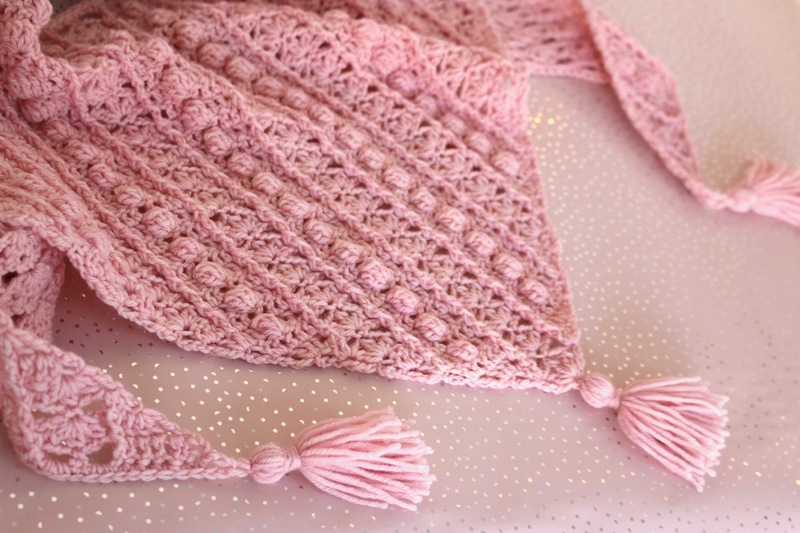 So the other bit of exciting new I have is that it is now time for me to launch the Frosted Sugar Plum Shawl pattern. I want it to be ready in time for the show and also of course for those who can't make it there, the pattern will be available to buy as a digital copy too. 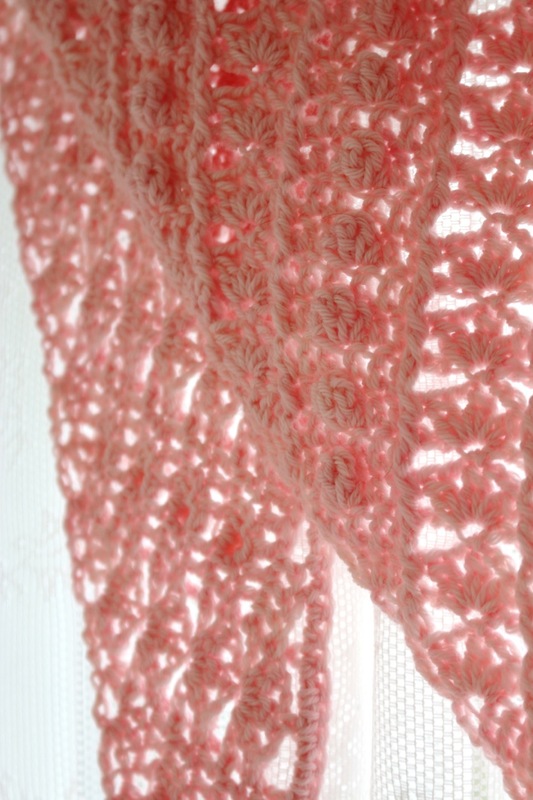 I thought I'd tell you a little bit about the shawl and the inspiration first though, if you don't mind. 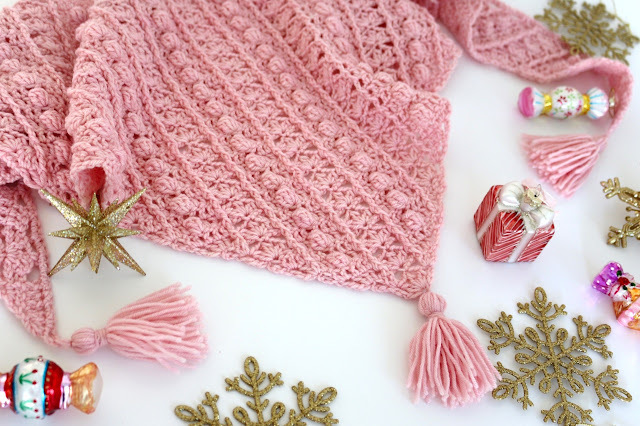 Natasha gave me free choice of her beautiful yarn shades and this absolutely gorgeous shade of soft, warm, sweet pink, called Candy Floss completely won my heart. I'm a sucker for the pinks lately, I can't seem to help myself. It's quite hard to capture it's beauty in the pictures actually. This was pretty much the starting point for my inspiration. Colour often is. It was this squishy warm yarn with it's fluffy puffy name that got me thinking of lots of lovely texture. Stitches that would look best in a solid tonal colour, be interesting to make and also have plenty of snuggly warmth. The kind you nuzzle your face into. It also got me thinking of candied fruits and sugar encrusted goodness and all kinds of decadent sweetness... which lead me to thinking of the Nutcracker. The two ideas seemed (to me at least) to go hand in hand, the puffy popcorns reminded me of the sugar plums and the little clusters between are like the waltzing flowers. I don't know where the tassels fit into the story, but to be honest, I added those because I just like tassels! So there you have it, the Frosted Sugar Plum Shawl was born and I love it. I'm especially pleased with V shaping that I got. I used a different construction to achieve it and I'm really happy with it. It's kind of hard to see it fully in the pictures, it's hard to fit it in spread out. You can sort of get the idea from the hanger shots, but if you use the podcast link above, I show it off for you nicely in that. Available online through Ravelry, please see the link below for more information and to buy. 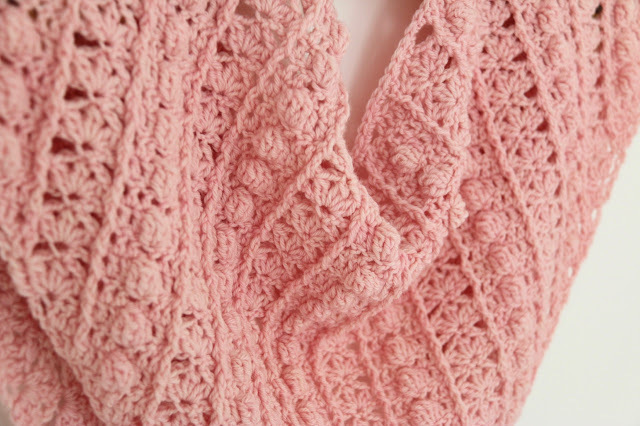 As always, I do very much hope you have as much fun making this shawl as I had designing it and that it keeps you all cozy and snug too. 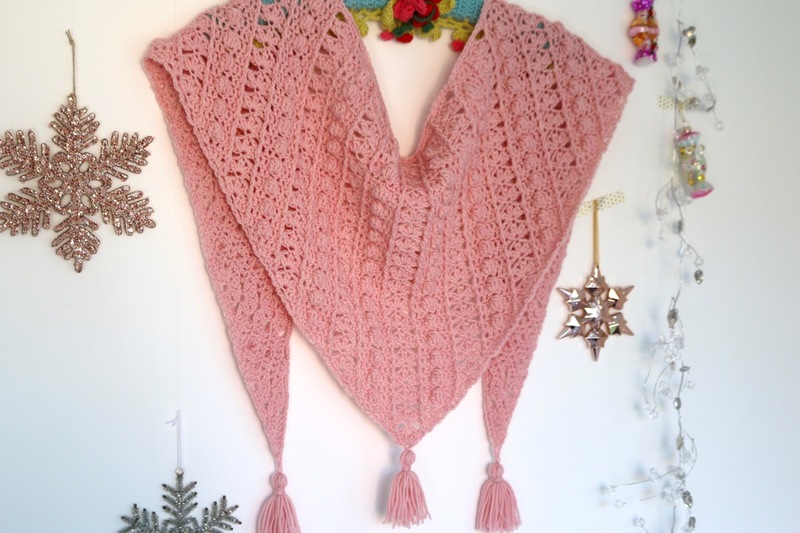 I also love seeing your shawls too, see if you fancy sharing using the hashtag #CherryHeart that would be fab! What a gorgeous pattern, Sandra. I do love that lovely soft feminine pink as well! The pink gets me every time of course ;-) I'm really looking forward to the release of your Pick 'n' Mix sock pattern , don't you wish there were more hours in the day! Ha ha, I'm glad I'm not the only pick lover! ;) Oh yes, sometimes, I really do!! The shawl looks A MA ZING. Really. I love the colour, the beautiful pink. The texture really comes through with this yarn. Well done! I will definately put this on my list of 4 billion things I still want to make hahaha. Thank you so much!! Ha ha I agree, that list grows fast doesn't it? 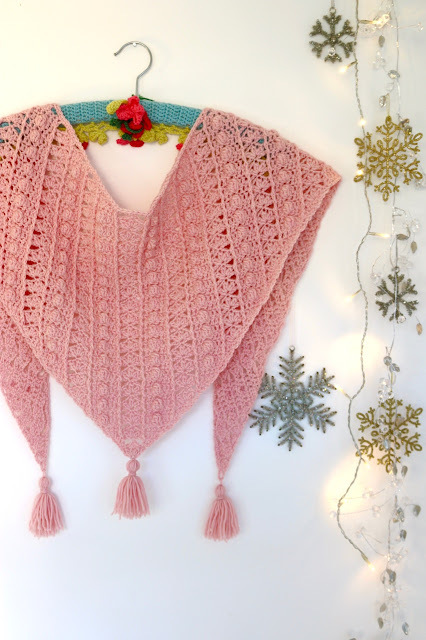 I don't make many shawls (have knitted but never crocheted one) as I find the shape makes them difficult to wear, but your beautiful Frosted Sugar Plum Shawl 's 'V 'shape is an extremely wearable and I could be easily tempted! Oh I'm so glad you like it, it's a shape I'm really enjoying at the moment.